It’s often said by detractors and obfuscates that “there is no demand for content mining”. It’s difficult to show demand for something that isn’t widely available and which people have been scared to use publicly. So this is an occasional post to show the very varied things that content mining can do. It wouldn’t be difficult to make a list of 101 things that a book can be used for. Or television. Or a computer (remember when IBM told the world that it only needed 10 computers?) Content mining of the public Internet is no different. Which universities in SE Asia do scientists from Cambridge work with? (We get asked this sort of thing regularly by ViceChancellors). By examining the list of authors of papers from Cambridge and the affiliations of their co-authors we can get a very good approximation. (Feasible now). Which papers contain grayscale images which could be interpreted as Gels? A http://en.wikipedia.org/wiki/Polyacrylamide_gel is a universal method of identifying proteins and other biomolecules. A typical gel (Wikipedia CC-BY-SA) looks like Literally millions of such gels are published each year and they are highly diagnostic for molecular biology. They are always grayscale and have vertical tracks, so very characteristic. (Feasibility – good summer student project in simple computer vision using histograms). Find me papers in subjects which are (not) editorials, news, corrections, retractions, reviews, etc. Slightly journal/publisher-dependent but otherwise very simple. Find references to papers by a given author. This is metadata and therefore FACTual. It is usually trivial to extract references and authors. More difficult, of course to disambiguate. Find uses of the term “Open Data” before 2006. Remarkably the term was almost unknown before 2006 when I started a Wikipedia article on it. Find papers acknowledging support from the Wellcome Trust. (So we can check for OA compliance…). Find papers with supplemental data files. Journal-specific but easily scalable. That is exactly what we plan. It depends on the graph. (b) is all the detail visible? Can you send an example? Ideally one which is visible on the web. There are so many graph variations that this would be hard. Just consider the problem of graphs with different shaped points – identifying them and then finding their centers. IMO, this is better done as an app that loads the graph image and key points are then extracted by hand and the values calculated by the code. My sense is that this would make a great crowd project – lots of individuals doing the work for each chart. You might want to take a random sampling of charts to see how feasible this is. I looked at it about a decade ago when I co-founded a data start-up. Maybe I wasn’t inventive enough, but it looked like the only viable solution to me was an application assisted human to speed the process. I opened the PDF, zoomed as much as possible, took a “print screen” and then measured the data position “by hand”. That figure is also available as part of a larger JPG in the HTML version of the paper. – finding papers with EPR spectra and extracting each spectrum for properly named files. – Find cartesian coordinates of molecules in Supporting Information PDF files and convert all of them them to a single file in the popular XYZ format so that all geometries may be easily analyzed with molecular visualization software. – Track nomenclatural changes of microorganisms across the literature, build a central “synonymy list” so that any search for (e.g.) Cupriavidus metallidurans automatically retrieves the literature for its synonyms Ralstonia eutropha, Ralstonia metallidurans and Alcaligenes eutrophus. – collating the results of all redox titrations of metallic sites in proteins, classified by protein, metal center, technique (EPR-monitored, UV-Vis, electrochemistry) and source. Feasibility depends slightly on whether info is in full text or suppinfo. The former is more likely to be vectors but more variable. If vectors we should get the full set of data to same resolution as published. If pixels it will be worse than 1 pixel. That will be very valuable and we can also archive them in Crystallography Open Database. We are starting to take theoretical coords there. We can extract names with high precision/recall but will have to leave reconciliation to experts. I would need a small corpus to comment on. The greater the consistency of presentation the easier. “- collating the results of all redox titrations of metallic sites in proteins, classified by protein, metal center, technique (EPR-monitored, UV-Vis, electrochemistry) and source. This is very useful. We can certainly use the phrases to retrieve the paper. It may be possible to extract actual data. It may be possible to link it within tables. Whether it’s possible to pull out more structured info – like the sites in the protein I don’t know. You have probably already thought about this: extracting the specifics of computational chemistry calculations, which are typically set in prose. I really we would like to use the log files where we can extract massive amounts of data. But it’s a question of how formulaic the language and tables are. I don’t think the protein gel recognition even warrants a summer project. The images are quite distinctive – horizontal bands with similar pixel colors across much of the x axis. The markers should be easy to detect within the image. The PLOS site would be a good resource to test the methodology and code. 2D protein gel identification would be another interesting target. That might well be a bigger project. So what sort of queries are you expecting with gel electrophoresis identification? Find me all papers with mention of protein X AND with a protein gel image as part of the content? 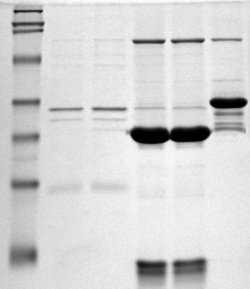 One issue that occurs to me is that protein gel images are likely to be confused with northern blot (amongst others) images. Does that matter, or would gel electrophoresis images be the recognition target? I think you have answered my question. You want the caption to be read too, to identify the image and details of the result. So as long as the caption is text in the body, identified with a Figure number, he can capture it. That seems reasonably straightforward, although positioning of teh caption may be an issue. A number of images have no source or caption (e.g. https://www.flickr.com/photos/123636286@N02/14319160853/ ). I am not clear why neither the source nor the caption was captured. In the era when the cloud was still nascent, I knew a company that was building a database to relate text and images for rapid search. I don’t know what happened to them (and I forget the name) but I hope they were successful and migrated to the cloud, as the possibilities were cool and meshed with the web based chemogenomics database the company I worked for had built. Where we relied purely on created numeric and text data, this other company could add images of 2D gels, x-rays, charts, etc., necessary for inspection before believing the data. I didn’t realize images submitted for publication could/would have caption metadata attached. Interesting. I assumed that they would be simple file formats – jpg/png/bmp etc and that any information about the image would be added to the text body or be part of the image (e.g. annotation). Are you putting together something in this regard?